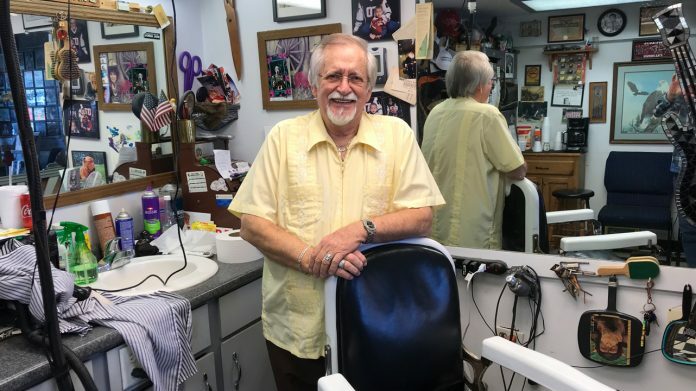 One of Dayton’s downtown businesses, “The Eagles Nest Barber Shop”, owned and operated by Bobby Beard will be celebrating its 50th Anniversary. Friends and family have planned a celebration of this milestone on Saturday April 20, 2019 from 8 am until noon, and the public is invited to come out and join them! According to Cheryl Beard, who is organizing the event, the street in front of the barber shop will be closed off. There will be food, drinks, cake, and other goodies for all to enjoy. Bobby will be giving Dayton resident George Beaty a haircut to commemorate George as being Bobby’s very first customer when he first started cutting hair. Bobby still has the framed $1.00 bill hanging on the wall from that haircut payment. Bobby is a 1969 graduate of Rhea Central High School in Dayton. He began his career cutting hair in 1969 working for Richard Peters at the “City Barber Shop”. Bobby worked at that shop for about five years before he purchased it from Richard. He wanted a new and unique name for his barber shop. Since all the county high school students were transitioning into the new Rhea County High School in Evensville with their mascot being a Golden Eagle, Bobby came up with the name “The Eagles Nest Barber Shop”. Bobby has always been known across the county as a musician. Bobby is the only surviving member of The Fables. They were a country group which was organized in 1963. Other members of The Fables were Benny Daniels (leader and vocalist), Jug Standifer (bass guitarist and vocalist), Bobby Beard (lead guitarist and vocalist), Perry Massengill (fiddle player), and Carson Langston (drummer and vocalist). The band headed by Benny Daniels recorded for Chart Records in Nashville, Tennessee. The Fables made their debut on National Television in 1974 on the show “To Tell The Truth”. Benny Daniels and The Fables performed their latest song, “Will The Real Broken Heart Please Stand Up”. “To Tell the Truth” was a nationally syndicated TV series with their studio located in New York City. They taped the show during the week of February 11, 1974. Appearing with the group was Gene Woods of Cleveland, Tennessee, Arrow Records executive, Songwriter and Artist for Chart Records. Woods, who wrote the song based the verses on the popular TV series and appeared as one of the three contestants. Following Gene Woods appearance, the band members preformed the song for the live audience, panel, and moderator Gary Moore. Personalities appearing on the panel were, Nipsey Russell, Peggy Cass, Kitty Carlisle, and Bill Cullen. According to Bobby, the barber shop has seen many famous musicians over the last 50 years. A few of the big names were Tex Ritter, Roy Acuff, Bill Carlisle, Little Jimmy Dickins, and Glen Davis. Beard stated that he cut Bill Carlisle’s hair while he was there. Roy Acuff entertained the children in the barber shop with his yo-yo skills on his visit. There were also two wedding ceremonies held in the shop in years past. Bobby says not much else has changed. Haircuts are still just $5.00, the same price they have been for years. Bobby says he has no plans of retiring anytime soon. The Dayton Chamber of Commerce Strawberry Festival Committee has named Bobby Beard the 2019 Festival Parade Grand Marshal which will be held on May 11, 2019. We are driving in from Battle Creek MI and will be there for Strawberry parade. Long time friends with Bobby and Cheryl Beard. Would like to let them know but have no phone number. Please let them know if possible. My cell is+12693581177. Thank you and have a wonderful day.